This is a self-contained Windows-based installer that includes the Ruby language, an execution environment, important documentation, and more. RubyInstaller-2.6.0-1 has been released. 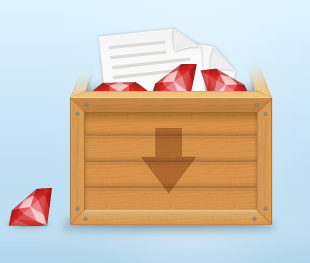 See the ruby-2.6.0 release post and the the RubyInstaller CHANGELOG for more details. Please note, that many gems are not yet compatible with Ruby-2.6 on Windows. You should therefore stay on 2.5 until 2.6 is well supported, unless you want to contribute and fix remaining issues. RubyInstaller-2.5.3-1 and RubyInstaller-2.4.5-1 are released. These are maintenance releases with bug and security fixes. See ruby-2.4.5 release notes and ruby-2.5.2 release notes. Bundled OpenSSL versions are updated to 1.0.2p and 1.1.1. RubyInstaller-2.5.1-2 and RubyInstaller-2.4.4-2 are released. These maintenance releases fix a bug in ridk install which prevented the download of MSYS2 and update to the MSYS2 installer version 20180531. More details are provided in the CHANGELOG. RubyInstaller-2.5.1-1 and RubyInstaller-2.4.4-1 are released. These are maintenance releases with some bug and several security fixes. See ruby-2.4.4 release notes and ruby-2.5.1 release notes. In addition bundled OpenSSL versions are updated to 1.0.2o and 1.1.0h. RubyInstaller-2.5.0-2 and RubyInstaller-2.4.3-2 fix a package conflict while ridk install. If you’re new to Ruby, check out this online course from The Pragmatic Studio to learn all the fundamentals of object-oriented programming with Ruby. If you’re looking to create Ruby on Rails web apps, you’ll learn how to build a complete Rails 4 app step-by-step in this online course also from The Pragmatic Studio.